This mindful dish is no boring salad. It appeals to all the senses: beautiful to look at, delicious to taste, a refreshing aroma from dementia-shielding citrus and a satisfying crunch from brain-healthy, antioxidant rich Pecans. In this recipe, avocados sub for the cheese, while toasted Georgia Pecans sub for the crunch of croutons and flavor hit of bacon (You could even use smoked pecans). ¼ cup minced fresh parsley. Fresh ground salt and black pepper to taste. On large platter arrange the lettuce and arugula. 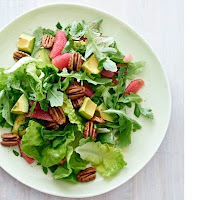 On the bed of greens arrange the avocado and grapefruit segments. Combine the ingredients for the dressing and drizzle over the entire salad. Garnish with toasted Georgia Pecans. Add final garnish of minced parsley.